There are five categories among all nonagricultural workers who are officially counted as employed: government workers, private household and private industry workers, the self-employed and unpaid family workers. Among them there are three additional status classifications: those employed part time for economic reasons, part time for noneconomic reasons, and those employed full-time. An analysis of recent trends reveals that the number of part time workers is on the increase, while the number of full-time workers is on the decline. 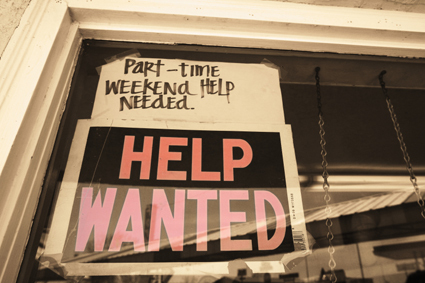 Part time for economic reasons refers to those who worked 1 to 34 hours during the reference week for a reason such as slack work or unfavorable business conditions, inability to find full-time work, or seasonal declines in demand. Part time for noneconomic reasons refers to persons who usually work part time for reasons such as childcare problems, family or personal obligations, school or training, retirement or Social Security limits on earnings, and other reasons. Excluded are persons who usually work full time but worked only 1 to 34 hours during the reference week for reasons such as vacations, holidays, illness, and bad weather. Employed full-time refers to those who worked 35 hours or more during the reference week. This includes workers who have both one full-time and part time job as well as those whose combined hours in two or more part time jobs total at least 35. Are you with me so far? Good. 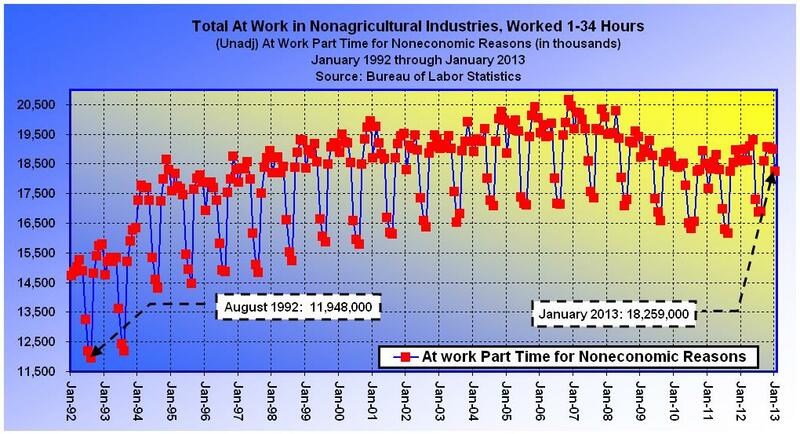 The chart above displays the number of nonagricultural workers employed part time for economic reasons. It extends from January 1992 through January 2013 for historical context, but what should stand out is the difference between where we are today, versus the month the recession began. In December 2007, at the onset of the Great Recession, 4.6 million workers were employed part time for economic reasons. Yet as of last month, three-and-a-half years after the recession ended, the figure stands at 8.5 million, an increase of 3.9 million, or 83.4%. How’s that for progress? If measured from the peak of misery, I suppose one could perceive an improving situation, however in more concrete terms, Americans are actually worse off today than at any time since 1993. No amount of words can change the facts. 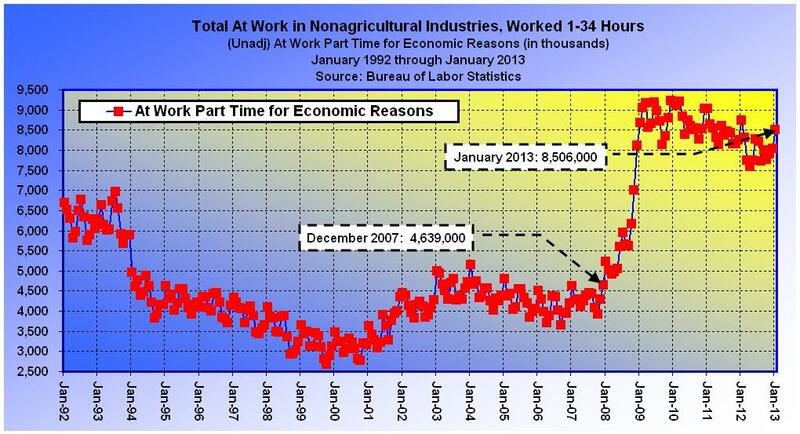 The second chart (above) shows the number of nonagricultural workers employed part time for noneconomic reasons. This isn’t all that relevant on its lonesome, because it represents those working part time because they want to. However, what is significant is that the number has grown by a staggering 6.3 million since the early 1990’s. In fact, when combined with the previous chart, we find that as of January 2013, a total of 26.7 million out of the 139.7 million officially counted as employed (see chart below), or 19.1%, are merely part-timers. This would be great if our workforce was able to work fewer hours for greater pay, without need of governmental assistance, but we all know that’s not the case. So what? 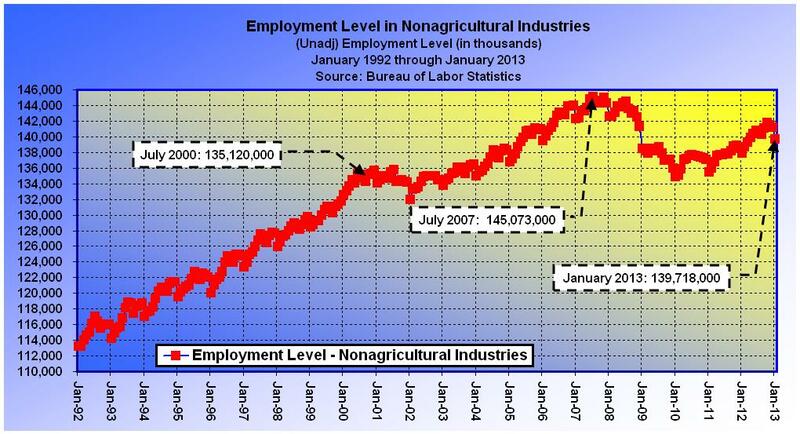 So, the next chart (above) shows that in July of 2000 there were a total of 135.1 million nonagricultural employees, that the number grew to 145.1 million by July of 2007, and that it has since declined to 139.7 million. Again, if measuring from the peak of misery, it would appear that the employment situation has improved, but in real terms, we have 5.4 million fewer workers today, than we had in 2007. Thus, we are effectively back where we left off at the end of 2005, more than seven years ago. I guess that’s good in the eyes of some, but when discounted for the growth in the number of part time workers the situation is bleak. In the last chart (above), when the number of nonagricultural workers employed part time, both for economic and noneconomic reasons, is subtracted from the total employment level, we find that the number of full-time workers has declined from 123.1 million in July 2007, to 112.9 million in January 2013. 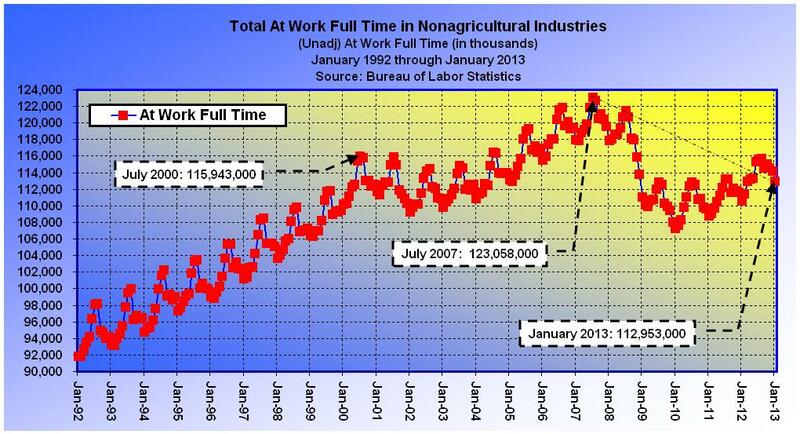 In other words, we currently have 10.1 million fewer full-time workers than existed at the pre-recession peak. Also notable is the fact that the number of full-time jobs in existence today, 112.9 million, is fewer than the 115.9 million which existed in July of 2000, more than a decade ago. I suppose one could find a way to twist these numbers into a bright and rosy future, that is if one has no sense of where we have been or where we are headed, but since government spending is currently twice what it was just a decade ago, and politicians are frantically grasping to fill a gap, which for all of their efforts has merely widened, I fail to comprehend their hardheadedness. According to POTUS, “We’ve created 6 million new jobs under my administration.” But according to reality, we currently have 5.4 million fewer workers than we had just over five years ago, 10.1 million fewer full-time workers, and 3.9 million more are employed part time for economic reasons. So you tried your plan, and it failed, and the employment situation won’t improve until government stops playing enabler, gets out of the way, and lets God reign. The data presented in this post was obtained through the Current Population Survey (CPS), a monthly sample survey of about 60,000 households conducted by the Bureau of the Census for the Bureau of Labor Statistics. ← Paranoid LA Cops: Shoot first, use brain never.